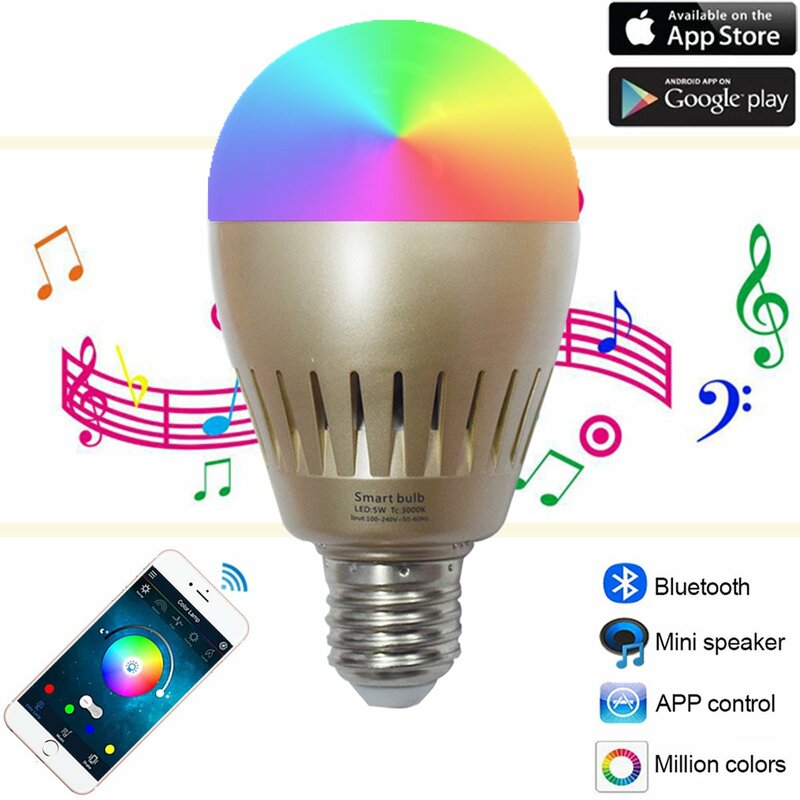 Home › Energy-Efficient LED Lighting › Santaro A19 Bluetooth Smart Led Music Speaker Bulb Rgb+W Dimmable - 7W 100-24..
Santaro A19 Bluetooth Smart Led Music Speaker Bulb Rgb+W Dimmable - 7W 100-24.. Millions of Colors - Santaro smart Bulb could personalize over 16 millions variety tones by color palette on APP. Each color is dimmable from 0%-100%, and could be easily adjusted by different scene settings and could flash with rhythm. Wonderful Audio Frequency - Santaro speaker bulb uses 16 core 5mm magnetic double speakers, enhancing the sound surround ambiance and clearness. It will keep sound output stable in a room under 800 square feet, offering you a pleasant listening experience just from a single bulb. Bluetooth APP Control - Our APP program "iLight" is available on IOS and Android systems, controlling lights by your mobile devices through Bluetooth 4.0. If you can't find the bulb on devices list of iLight APP,please notice the interfere from other wearable bluetooth APPs. Thoughtful Design in Detail - The slim body of Santaro smart bulb speaker will fit in every lamp just like normal A19 bulbs. Professional light and sound pleasure could be easily achieved in standard E27 socket. Designed with high-end 5W SAMSUNG LEDs, offering stable brightness equaling to 40W incandescent bulb. Excellent Gift - Santaro music light bulb is a good choice for decoration in house, restaurant, company etc. It can be used in any holidays, such as X-mas, Halloween, Valentine's Day etc. So many functions make it a great gift to families and friends. Color: Gold Superstar - Santaro Smart LED Bulb Santaro music LED bulb is a bulb revolution, combined speaker and LED bulb.APP control, energy saving, inner speaker, millions of colors available,function memorize make Santaro smart music LED bulb speaker a superstar. Simple & Fast Setup Santaro smart LED bulb fits for all E27 screw base lighting fixtures, downloadthe Free "iLight" APP in Apple APP Store or Google Play Store. Then you canenjoy to control the bulb. This bulb can work between 110-240V. So it will work well in US and Europe Quick Setting There's a "Shake" Mode, it can have a quick control of on/off, music or colorchanging. Light Synchronized Music When you open the app, you can find a music button on the top right corner,click this button, you can play all musics in your cellphone. When you intomusic play interface, you can see "Music rhythm" button, the light color willchange synchronously with music. Timer Mode Use the timer scheduling option to turn your smart bulb on or off at any time. Application House decoration, party decoration, holiday decoration, outdoor decoration,Christmas decoration, study room, baby room, bedroom etc. Warm Reminder: Please keep the bulb open before you search the bulb bluetooth.The bulb mustbe installed in socket for mobile devices first connecting with iLightbluetooth APP. Wearable bluetooth APP may influence the connection, please remove thosebluetooth APP from your mobile devices if you cannot connect the bulb. This will only allow you to control and sync to one bulb at a time. If youwant buy more than 1pc and want sync all bulbs together, please let us know inadvance.